The Lyme Regis Fossil Festival took place in Dorset on 2-4 May 2014. Our palaeontologists Lil Stevens and Zoe Hughes report back from a weekend of sun, sea, fossils and fun. Day one is schools day at the festival and we talked about science to lots of primary school children. Our drawing challenge was a great success and there were lots of really creative fossil reconstructions. We have attached the worksheet to this post so that you can have a go too! Tweet your pictures to #NHM_cephalopoda – we want to see what you come up with! Emma Humphreys-Williams, our volcano researcher had a lot of fun today working out the best way to demonstrate a volcanic eruption. Her search for gently explosive ingredients sent her to a shop in Axminster where she was recommended ‘horse vinegar’ – coupled with bicarbonate of soda it seemed to do the trick. Cola and sherbet dibdab was much nicer smelling but not so impressive and very, very sticky! 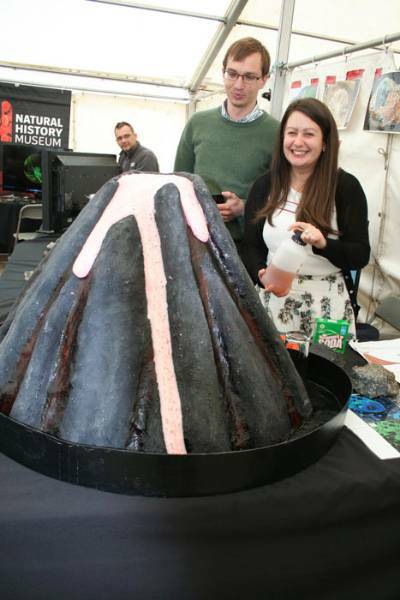 Emma Humphries- Williams with her successfully erupting volcano! 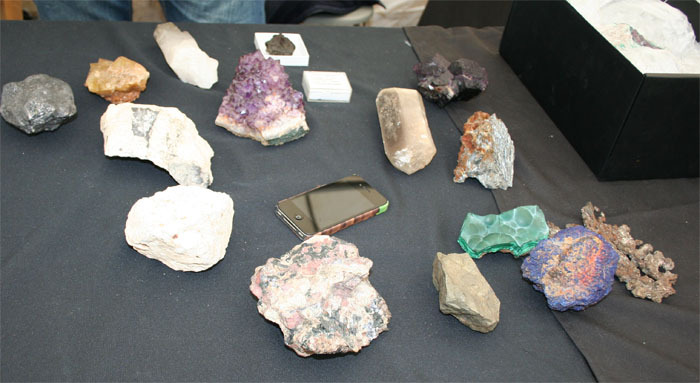 Mike Rumsey showed us how to make a mobile phone out of minerals – clever! And Emma Bernard wowed everyone with her massive teeth – that’s Megalodon teeth, of course. All of the minerals needed to make a mobile phone! Margaret Clegg has an amazing set of real palaeolithic hand axes from Swanscombe, one that was broken and discarded and one that was broken and then re-knapped to be used again. They’re amazing! Kent has been recycling for a long time! 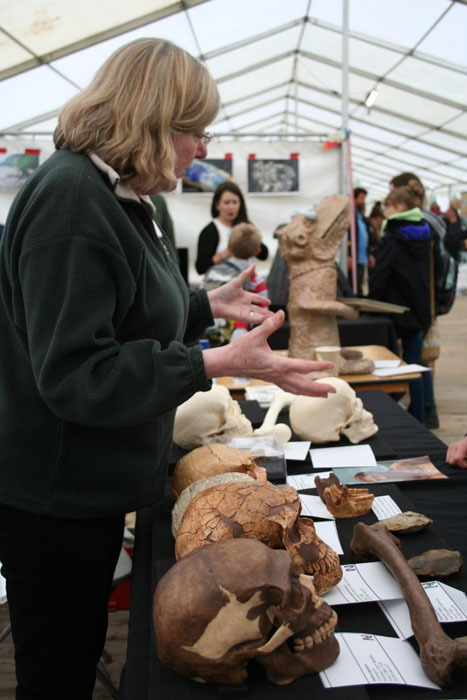 Margaret Clegg with her replica skulls explaining human evolution. On Saturday and Sunday we're open to the public. There are lots of amazing activities and displays and we hear the sun is going to come out this weekend so we can recreate the tropical sea! With pasties!